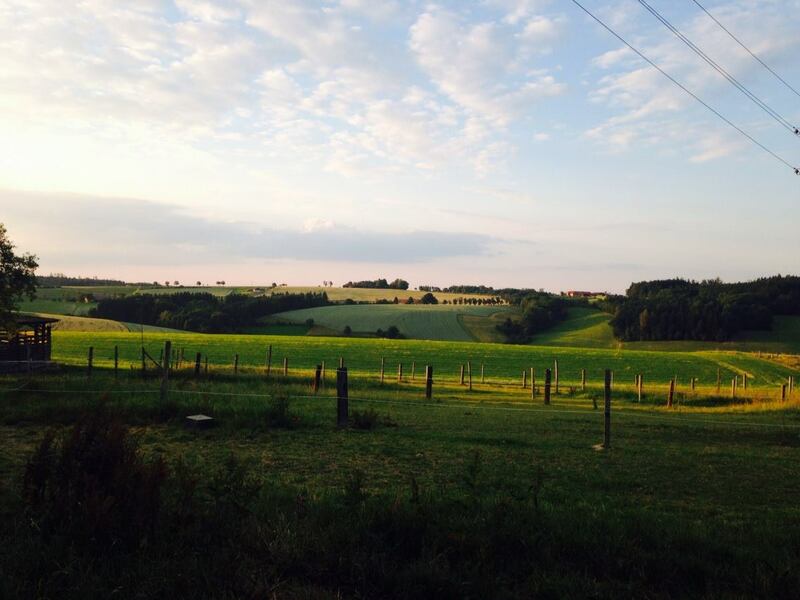 Verdant long grass was bowing in the wind as waves of darker green were pushed over the meadow. At the entrance, I passed a group of young teenage girls lolling in the shadow of the fortress wall – in the center a girl in red leggings, with a bright blue backpack, and with a long shiny braid the color of ripe wheat. Just a few meters away, the boys from the same group told jokes, popped gum bubbles, and tried to steal each others’ sandwiches out of their bags. 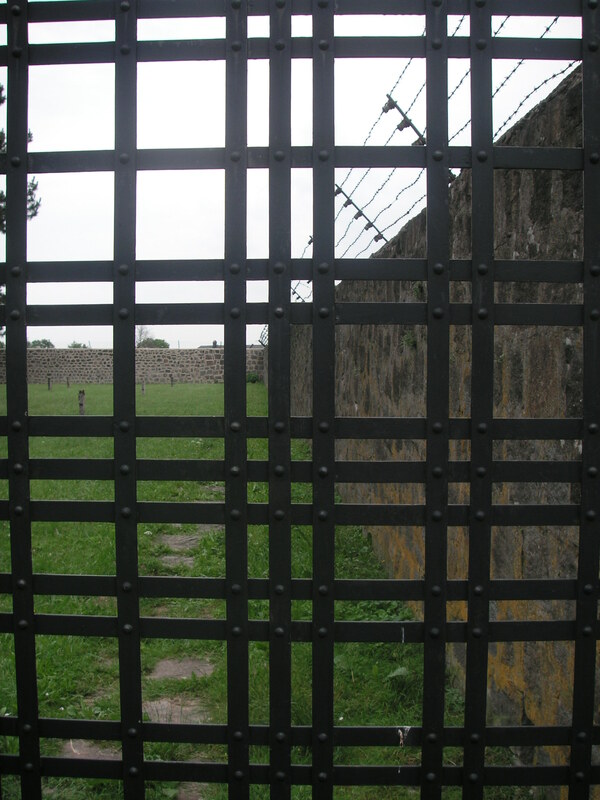 Four rows of barbwire ran atop the grey fortress walls anchored by guard towers in the middle and at the corners. 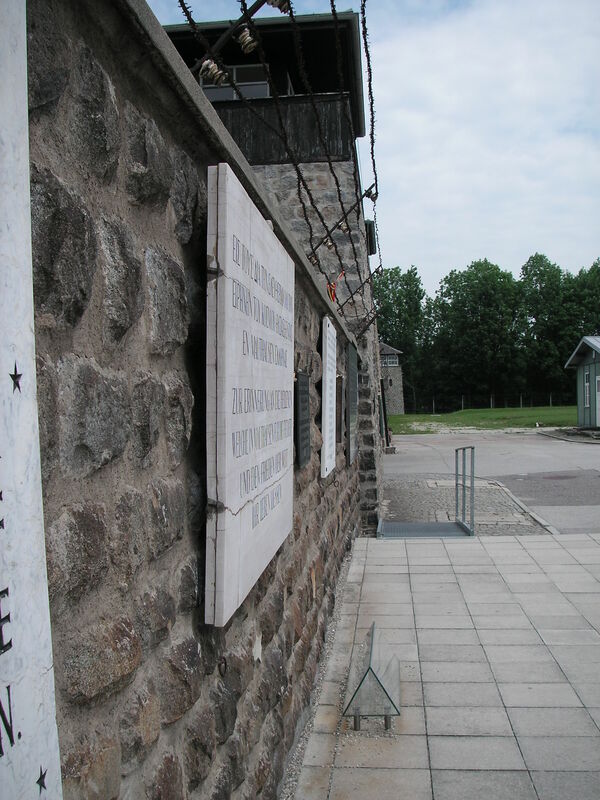 Individual blocks of granite from a nearby quarry formed the ribbons of wall decorated with polished granite plaques: “In remembrance of the soldiers of the 26th (Yankee) Infantry Division, Third US Army who liberated….” I walked through the gate below the plaques and onto an empty large square, the roll call area, flanked by rows of one-story buildings and ending in another grey wall. Polished plaques upon plaques reflected parts of my face and remembered the 122,766 prisoners murdered here – political dissidents, Roma and Sinti, freedom fighters, homosexuals, Jews; the signs did not seem to end. A black-and-white photo display showed the same square I stood in, but in the photo the square was crowded with hundreds of naked males, most crossing their arms as to hug themselves. Most were standing; some were sitting on the ground and with their knees pulled up to their chests. All heads were freshly shaven. The crowd did not end in the photo and the square seemed infinite as if even more men were waiting outside the photo. But in front of me, the square was now empty, a wide plane of grey asphalt that was not in the picture. The two ovens in the next-door crematorium were draped in flags from Israel, Italy, Spain, and Poland. Black and white photos of men with their birth and death dates lined the walls in another room. The air was thick and much colder than it would make sense for a basement in summer. “Over the white pond the wild birds have moved on. 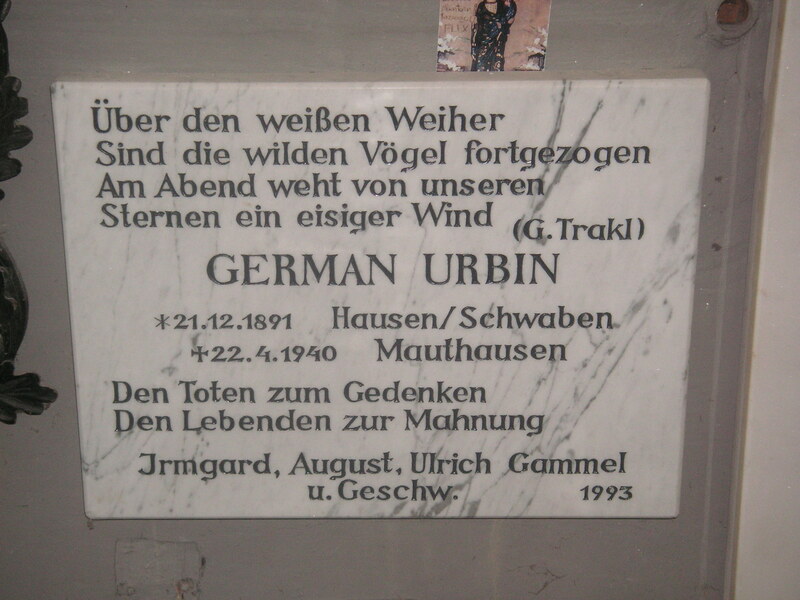 In the evening an ice-cold wind blows from our stars” a white plaque remembered German Urbin. And still the grass waves were running through the high meadow outside the camp; the waves were moving away and up the hill – one followed by another and another and another. At the top of the basement staircase, I ran into the class of twelve and thirteen-year olds that I had noticed before in the parking lot outside the gates. They were standing close to each other, nearly huddling but without physical contact. No one was speaking, no bubble popping, no braid swishing. 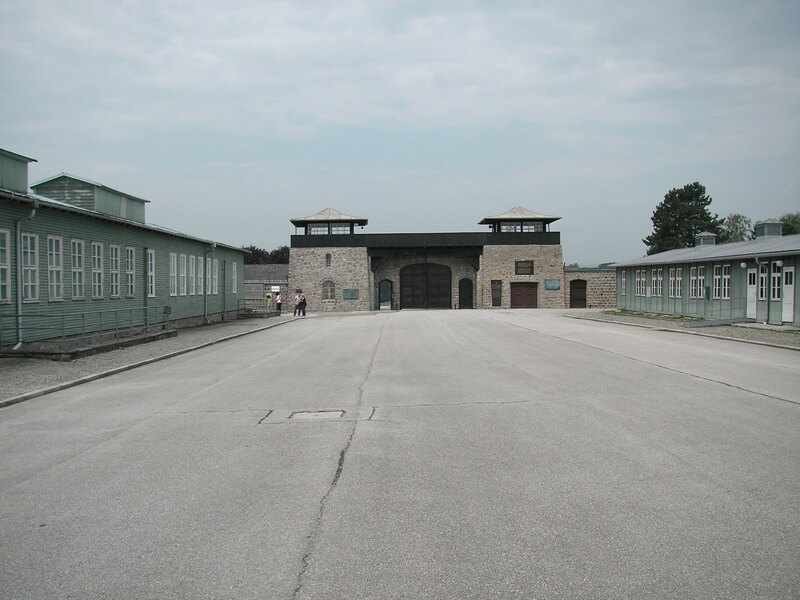 I had never before seen a group of teenagers that quiet, that still, as after the tour of the Mauthausen concentration camp. The article mentioned a talk about bejeweled skeletons, especially popular in Bavarian, Austrian, and Swiss cultures it seems. A topic that was not surprising to me really shocked some students; most could not imagine what such a bejeweled skeleton could look like. A search online for jeweled skeletons provided images, plenty of examples of splendid pieces of art decorating the bones of mostly saints (for example, see this article with detailed pictures of skeletons: http://www.cnn.com/2013/12/05/world/gallery/beauty-from-the-crypt/ ). 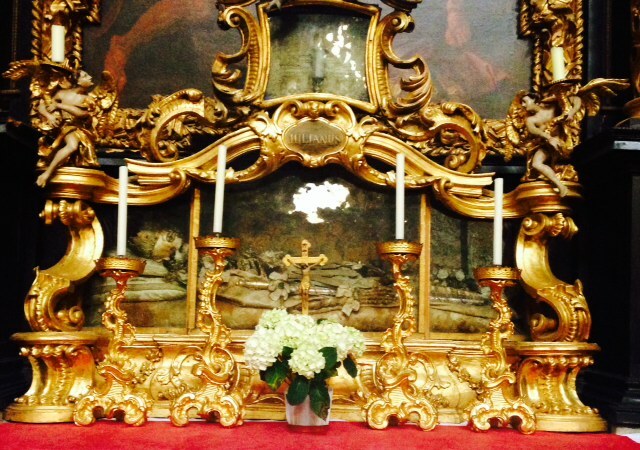 I did not expect to see a skeleton/saint in Schlierbach; it was not advertised in any way I noticed. But there he was, right up front but to the side of the main altar, not as bejeweled as some of the more spectacular examples online, but still impressive. 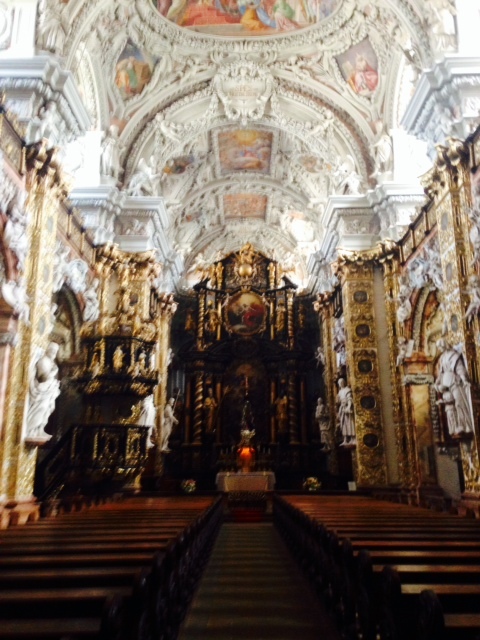 None of the Austrians visiting the church with me paid much attention to the saint. It made me wonder whether Austrians are more open to discuss death and accept death as a natural part of life and culture as indicated by the article. Even though the blog is called An Austrian in California, the first postings are from Austria (where I feel more like an Californian in Austria, but more about this in upcoming posts). 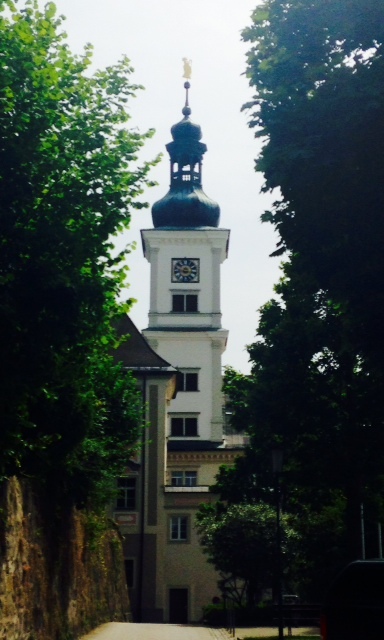 The trip to Austria finally gave me the last push I needed to actually start the blog and not just think about it. To start with, above is an evening view of Upper Austrian rolling hills that show the less mountainous and maybe less well-known but nevertheless beautiful side of Austria.